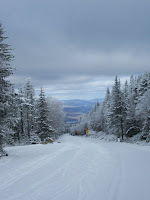 One of my regular fun things to do in the Fall here in the Adirondacks is cross-country ski up and then down the Whiteface Mountain Veterans Memorial Highway. The castle at the top and the Toll Road, as it is called in local parlance, were Depression Era public works projects and perhaps a test case for the New Deal Works Progress Administration (WPA) projects that followed. Imagine that, a publicly funded project that gave people the dignity of a job and is still generating revenue and being enjoyed 80 years later. What a concept. Aside from an occasional canine companion, I usually make the trip alone since not many people enjoy this particular aspect of the Toll Road; skiing uphill for 2.5 hours in 15 degree temperatures with wind chills around zero. It just doesn't pass their time invested and hardship endured reward ratio requirements. But the views at the top and along the way are lovely, and the ride down can be fun. To really do it right you need at least 3.5 hours, especially if you want to have tea and deal with clothing issues at the top. Tea is essential, as is packing extra clothing for the ride down. When snow conditions are a little low, like last week, you need to ride a flat ski otherwise you risk stone grinding your edges on the asphalt. Here's picture proof, taken at great personal peril; in the cold with mittens off, of how nice it is in the Fall on the Whiteface Mountain Toll Road.